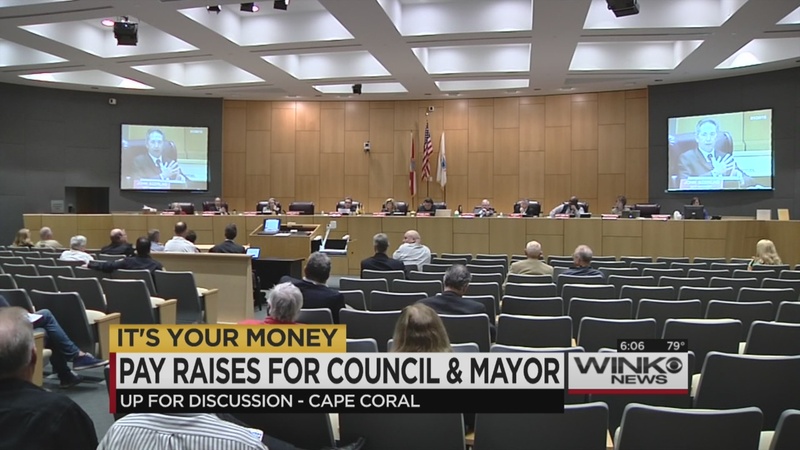 CAPE CORAL, Fla. – It’s your money, and more of it could soon be paying for higher salaries for the Cape Coral city leaders. The city’s charter review commission is currently discussing pay raises for the mayor and council members to better reflect their job responsibilities. “Their concern is – does the level of pay hinder some folks from jumping in to the arena?” said council member Rana Erbrick. Cape Coral is getting younger, and Erbrick says it’s time the City Council starts better reflecting the changing demographic. But in order to attract younger candidates, Erbrick says they need to start making more money. The mayor currently makes 20 cents per registered voter, about $22,000 a year. Council members make 17 cents per voter, just under $20,000 a year. The mayor of Fort Myers makes about $42,000 yearly, and council members about $32,000. Cape Coral Mayor Marni Sawicki says she’s okay with how much she makes, but isn’t sure future candidates will be. “I knew going into this this is what I was going to be paid… it’s typically only been held most of the time by retirees, so it’s important that our council actually makes up the demographics of our city, it’s time we need to start attracting some younger more qualified people for the council,” Sawicki told WINK News. Some Cape taxpayers aren’t convinced the council needs a bump in pay. “I think they could put the money somewhere else, as in the schools,” said Kerri Vallee. “I don’t think money should be their number one goal as to why to take the job. I guess it all depends on what kind of time they’re devoting, is one a full-time job and others a part-time job?” said Mark Atchison. “This by no means is a part-time job, the hours you put in to research what’s going on, meeting with civic groups, time in the office with meetings… it’s about 30 to 60 hours a week… hopefully that’s all being taken notice because those of us sitting up here right now we’re making a concentrated effort to do the right thing by the city,” said Erbrick. Erbrick says she’s not concerned with giving herself a pay raise, she’s more concerned about attracting future candidates, and said there may be a provision that would keep the pay raises from going into effect until the next election cycle. The discussion is just now starting to get underway. It still has to go through a number of various steps before eventually being considered for the November ballot.